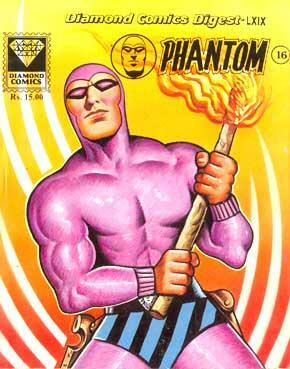 Phantom is an American adventure comic strip created by Lee Falk, also creator of Mandrake the Magician. A popular feature adapted into many media, including television, film and video games, it stars a costumed crime fighter operating from the fictional African country Bangalla. Phantom is the 21st in a line of crime fighters that originated in 1536, when the father of British sailor Christopher Walker was killed during a pirate attack. Swearing an oath on the skull of his father's murderer to fight evil, Christopher started the legacy of the Phantom that would be passed from father to son, leaving people to give the mysterious figure nicknames such as "The Ghost Who Walks", "Guardian of the Eastern Dark" and "The Man Who Cannot Die", believing him to be immortal. 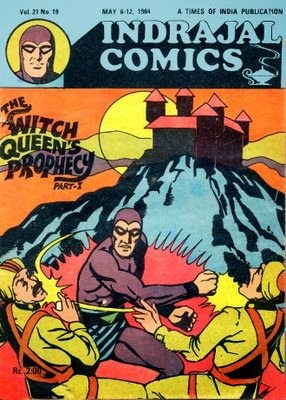 Unlike many fictional costumed heroes, Phantom does not have any superpowers but relies mainly on his strength, intelligence, and fearsome reputation of being an immortal ghost to defeat his foes. The 21st Phantom is married to Diana Palmer, whom he met while studying in the United States; they have two children, Kit and Heloise. Like all previous Phantoms, he lives in the ancient Skull Cave, and has a trained wolf, Devil, and a horse named Hero. Phantom was the first fictional hero to wear the skintight costume that has now become a hallmark of comic book superheroes and was also the first shown wearing a mask with no visible pupils, another superhero standard. Come back to checkout my favourite Indian cartoon/comics character whose name starts with Q!